Older Single Mum: Be Safe, Be Seen Campaign. Be Safe, Be Seen Campaign. I don't know about you, but the words 'Children' and 'Funeralcare' in near enough the same sentence gives me the Heebie Jeebies - to the extent that they almost put me off writing this post. But then I realised that's why it had to be done, because, thank the Lord, in this instance, it's for all the right reasons. Now that the clocks have gone back The Co-operative Funeralcare have launched their national Be Safe, Be Seen campaign. 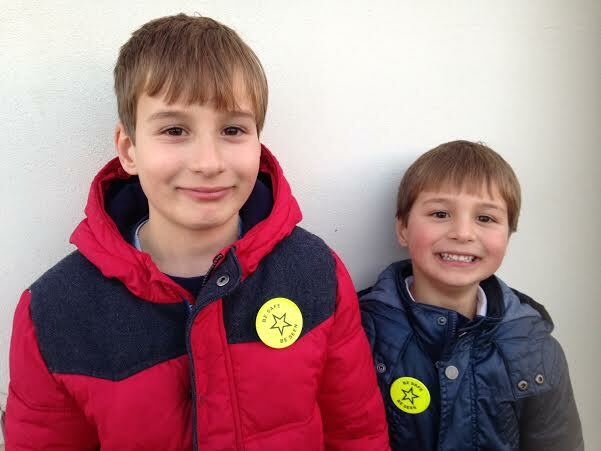 They work with primary schools all over the country, donating yellow high visibility reflective pin-badges designed to keep young children safe when the dark nights arrive. I'm always nagging my kids about being careful of driveways when they're running or scooting off and how careful and clever we have to be regarding traffic while we're out and about, so welcome any oppotunity to raise their awareness about road safety. Experience has shown these activities with schools are successful and they've released this 'brilliant' (according to my boys) video which spells out great points in a language that has hopefully had an impact bigger than my unladylike bellowing at them. I don't know why they need to be convinced by computerised images, but, let's face it, most children respond to them and anything that reinforces how important it is to think more about how to be safe and be seen can only do good. Here are the some of the tips covered, but I really recommend roping the youngsters in for a watch which wasn't even wasted on my nine year old! Look out for and encourage your children to be aware of hidden entrances or driveways when crossing pavements. Make sure your children walk on the side of pavements away from the traffic. It’s important to stop at the kerb, look both ways and listen to traffic before crossing. Pedestrian crossings can still be dangerous if care is not taken. You can read more about the Be Safe, Be Seen campaign and order free badges for your childrens' and other local schools on their site - HERE or, as we did, pop into your local Co-op Funeralcare branch and organize them from there. Plus, if you would like to add your support via @CoopFuneralcare and / or @TheCooperative, that would be appreciated. Let's keep the words 'Children' and 'Funeralcare' in near enough the same sentence for all the right reasons. Official Disclosure - I am a member of the Netmums Blogging Network, a unique community of parent bloggers from around the UK who have been handpicked by the Netmums team to review products and brands on their behalf. I may have been paid expenses and have been supplied with a product sample for this review, but retain all editorial control. All my Netmums Reviews will display the Netmums logo within the post. Love your boys, sweetheart - and a well written post...a commendable campaign. Excellent post. One vital tip that my family learned the hard way: don't cross a pedestrian crossing, even if the lights are in your favour, until cars in both directions have come to a halt because some just don't break in time. Oh Anna, I know your mum was severely hurt in such circumstance and I hope she is still improving. This point is actually made in the video, but with regard to an ambulance with blue flashing lights, rather than the carelessness that you have unfortunately encountered. I'm always telling my kids to look out for 'mad drivers' but you can't be too careful. Thank you for commenting. This mum must be proud of these wonderful boys :) I hope this campaign really works! They're very proud of them and other kids at school keep asking for theirs!